Everyone loves a good story, and it seems like everyone has their own version of a “big fish” story, where the fish they caught grows larger every time they tell the story. 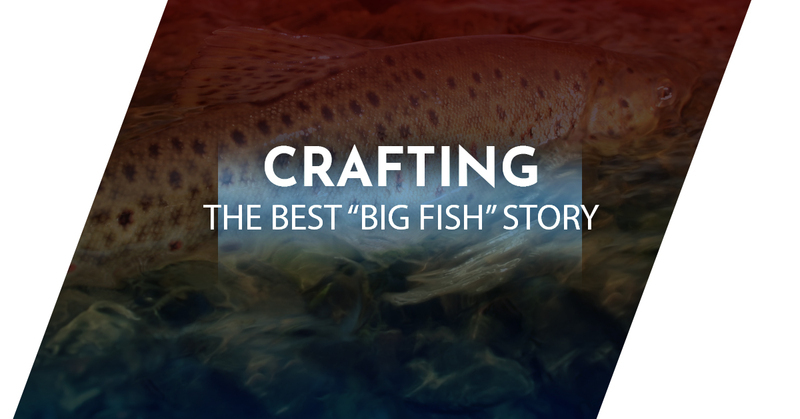 But crafting the best big fish story takes more effort than simply talking about the fish. Great big fish stories have drama, intrigue, and a bit of levity to them. We know all of this because we’ve spent a lot of time fishing, and maybe just as much time listening to big fish stories. So today, Killgore Adventures, the leading riverboat fishing expedition company in Idaho, will show you how to put together your best big fish story! How many tales have you heard that started with “Well there I was…” It’s not a cliche, it’s actually a great way to establish the setting of your story. In this case, you might open by describing the roaring Snake River, deep at the bottom of the immense Hells Canyon. While your story can avoid cliches like “a dark and stormy night,” you can use raging rivers, intense heat, and blustery winds instead. Immerse your listeners into the sights and sounds of Hells Canyon, even if they’ve never been there. Compelling characters can make or break any story. In this case, there’s no one more compelling than you! Play up your dedication to catching “the big one,” or your status as a mere fishing neophyte. Shining the spotlight on yourself doesn’t mean your side characters can be cardboard cutouts. Highlight spectacular people who added to your adventure, for instance, Captain Kurt Killgore, who bravely navigated your boat and crew through the harsh waters of the Snake River. Don’t add too many characters, as they can be hard to keep track of. If a friend went with you on your riverboat fishing trip and is around to hear the story, make sure to tie them into the narrative. No one wants to listen to someone rambling on about their fishing trip, not even other anglers. Making sure your story has a cohesive plot ensures that listeners will hang onto your every word, waiting to hear what happens next. You’ve already established your setting and characters, so your beginning is taken care of. Next, you need to think about the most important events. For a fishing story, you’ll want to highlight the major conflict of your riverboat fishing trip, the climax of the story, and of course the resolution. Suddenly, something happens. As you’re struggling to reel in the fish, the rod snaps! Your best friend falls overboard! The captain of the boat falls asleep! This is the height of the story, where listeners aren’t sure if you’ll bring home your prize, or you’ll reach the dock defeated. End your story with a heroic triumph over the unknown. You rescue your friend and catch a fish that sets a new size record in Hells Canyon. Incredible, truly, you are the hero. While the best big fish stories have an element of the fantastical to them, you’ll want to sure that is still sort of believable. Looking for the best inspiration for a new big fish story? Take a riverboat fishing expedition with Killgore Adventures! Throughout the fishing season, you can go after some of the biggest bass, salmon, and even sturgeon that North America has to offer! Sign up today!